After spectating all the prior Coffeeneuring Challenge events in fascination , I finally was able to be an active participant this year. Combining two things I enjoy so much, even with a few rules, was a delight. One of the most interesting outcomes of my participation was the opportunity to share with others what I was doing. When describing the concept, I could almost see how their thought patterns shifted from an initial, “how silly, why would anyone do that”, to a contemplative, “how delightful, why haven’t I done this already”. 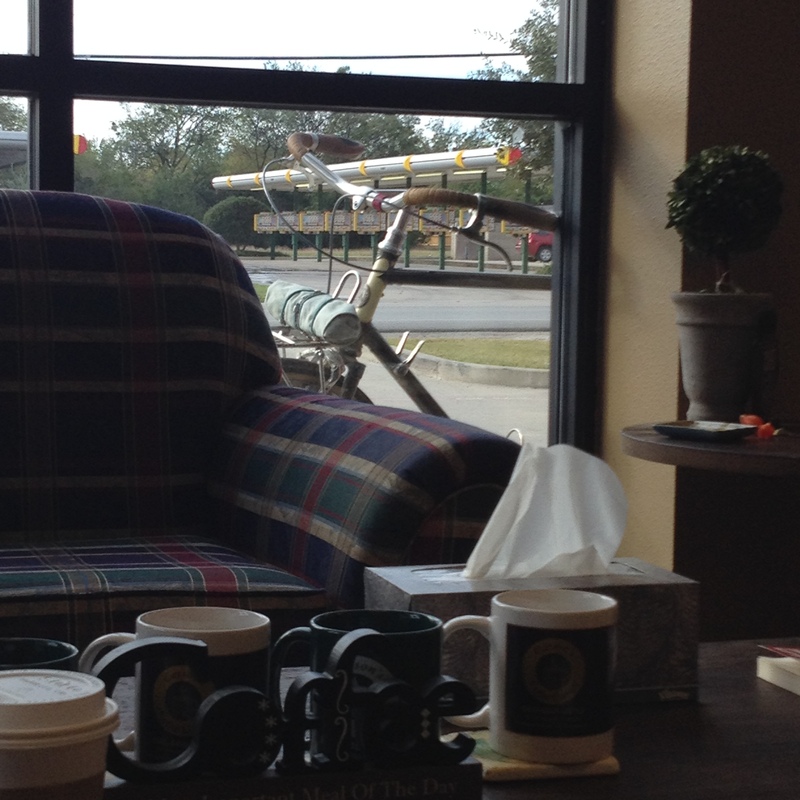 As expected in my rural location, most of my controls were coffee shops without walls. Still I worked in a couple indoor stops for variety. I was able to use three different bikes, and a variety of coffee-making techniques and toys. My stops covered a vast geographic area. Mostly, I was in and around Sanger, Texas. But one stop was in Corpus Christi (well over 400 miles south), and one was in Fort Worth (about 50 miles south). Description: Traveled down to Corpus Christi for my mother-in-law’s 80th birthday celebration, took the bike and coffee kit so as not to miss the first weekend of coffeeneuring 2014, pedaled backroads, shoulders, and bike lanes in my looped route, it was the coolest weather of the season so far in south Texas, and I found a shaded picnic table for a perfectly delightful outing. Description: I had to work this weekend, and drove into town to represent the City in a series of meetings. A had a mid-day gap of a few hours that allowed me to take the Quickbeam out for a downtown tour and coffee stop. As an almost exclusive rural rider, I was pleased at the relative ease I had in getting around town by bicycle. It wasn’t as nice as Madison, but it was better than I expected. The lack of bike racks at most of my destinations was plenty apparent, but I was always able to find some suitable solid object to lock my bike to that was closer than car parking spaces. 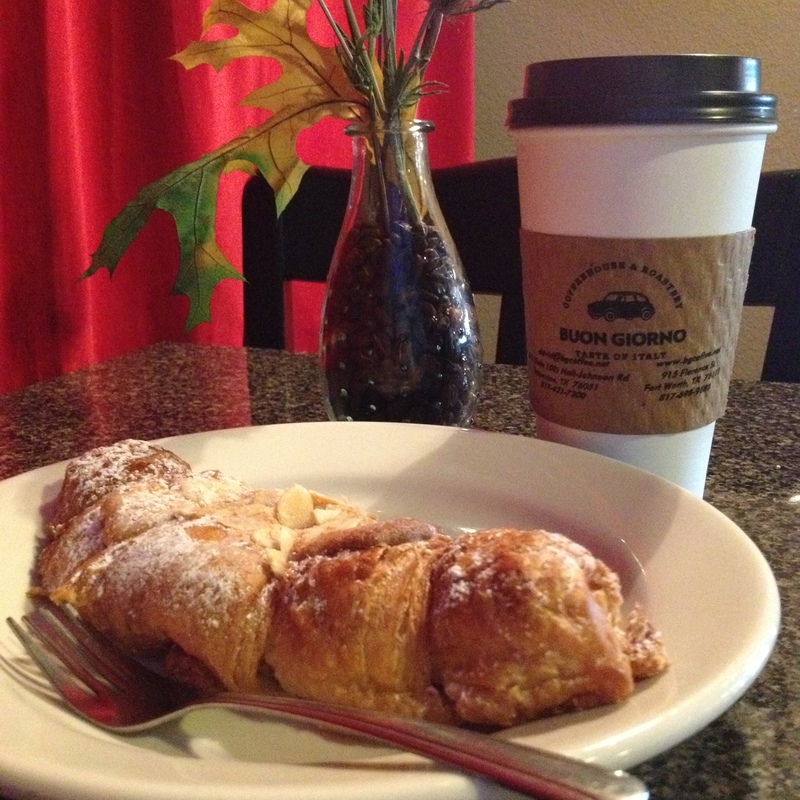 Buon Giorno Coffee is a calm environment serving up a wide variety of baked goods, quality coffee, and classical music. Refreshment for body and mind. 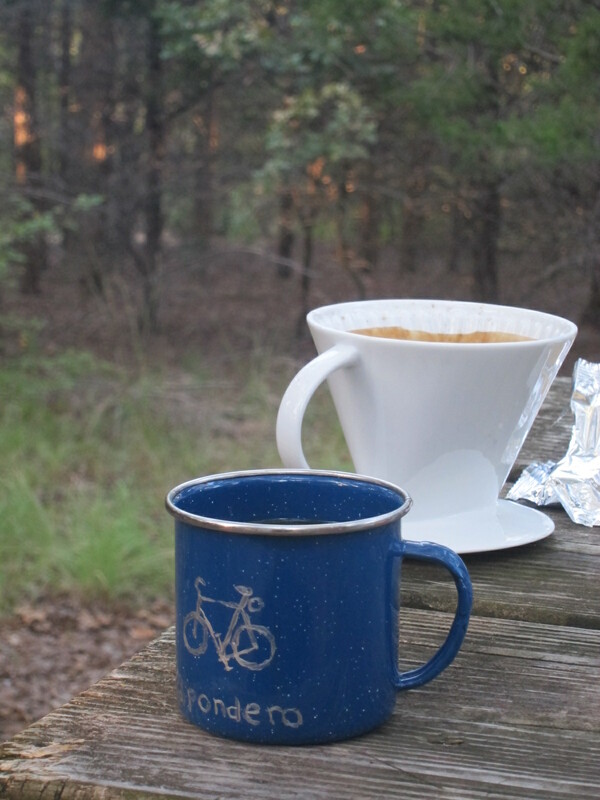 Description: Overnight bicycle camping (S24O) with buddy, Michael Stallings, at the State Park. We enjoyed the relatively cool evening, with campfires evening and morning. We spent much of our time lounging in our luxurious hammocks, and watched the mountain bike racers whiz by taking practice runs in advance of tomorrow’s race. Someone stopped and asked if we were racing. “Absolutely not,” I replied. What I didn’t say was that our objective was to see how lazy we could be. 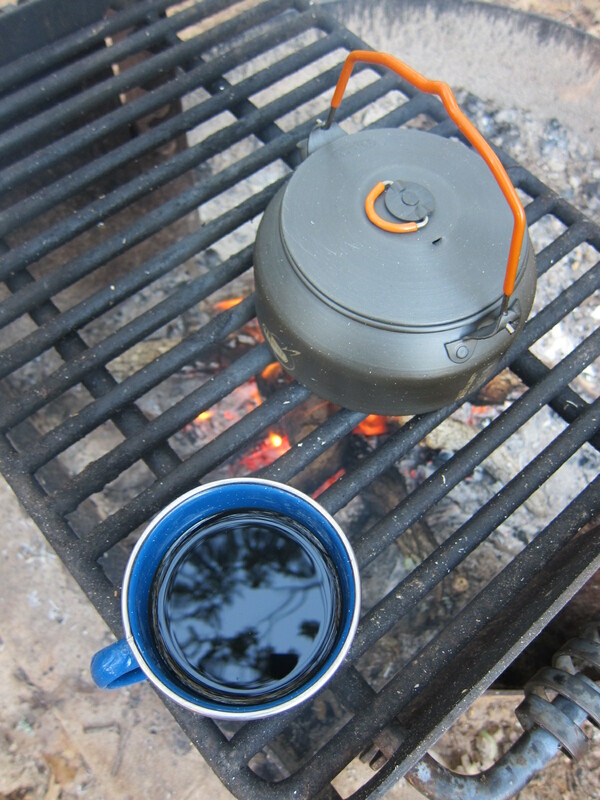 I think this was the first time I heated water in my kettle over a campfire (instead of the Trangia stove). We solved a majority of the world’s problems over two cups each. Then we rode around the Park for awhile in the morning before riding the 20 or so miles back home. Description: Unlike the first three outings, this was a typical Saturday morning ride for me. It was just the usual multi-hour, mostly gravel ride on one of my many loops that begin/end at my house. I had one truck drive by while stopped, and one more (who stopped to chat a little) as I was packing up to leave. Other than that, it was a bird-singing, leaves-rustling kind of peaceful spot. 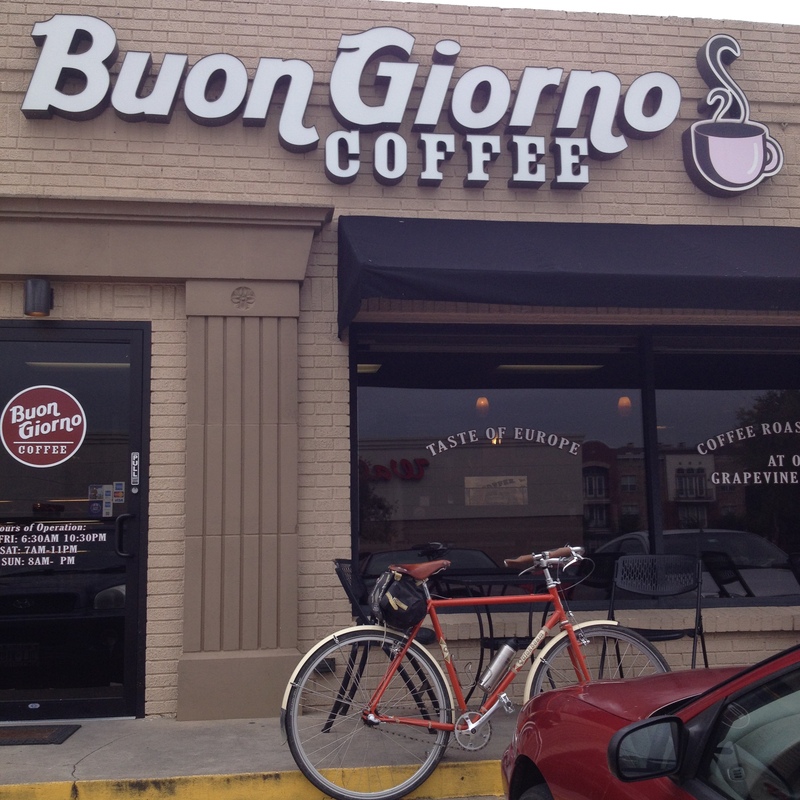 Bicycle accommodations and coffee at this location were excellent. The barista knows just the way I like my coffee. Description: This was the first day it really felt like Fall. I started my ride in the brisk high 30s temperature and made my way to a forested area. Along the way, I discovered additional secret overnight possibilities. I found the old abandoned bridge over the Elm Fork, sat still, and heard the babbling of the water through a nearby riffle. It was dead silent except for the breeze driven leaves beginning to tumble down, and that babbling. A bridge beam served as my bike stand and dining table. 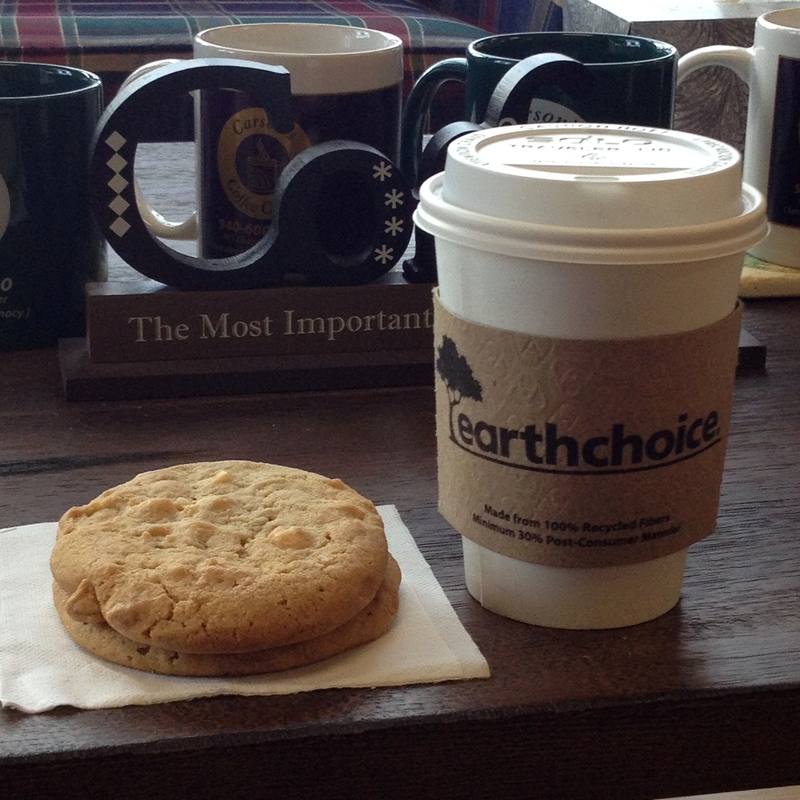 This is a coffee shop without walls that I most definitely will visit again. Description: I had no plan going to today’s outing, except finding coffee. 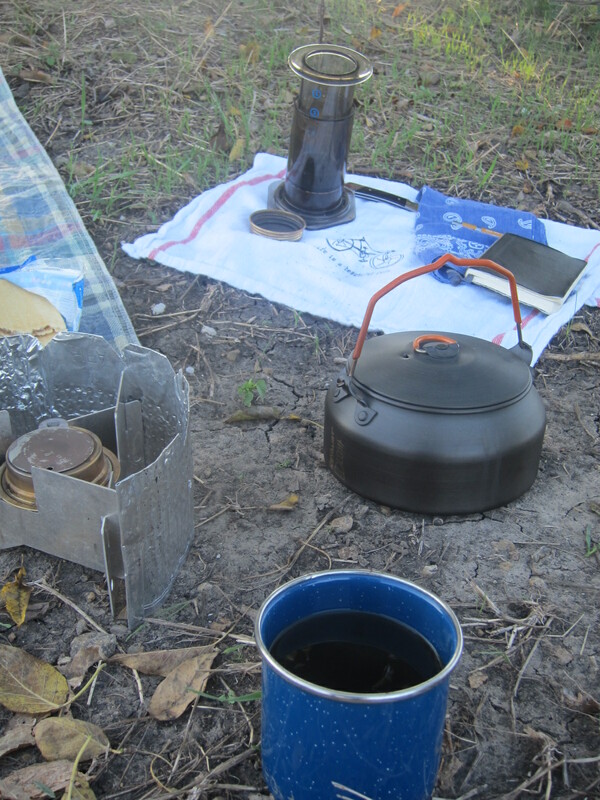 I was out of beans so a roadside brew-up wasn’t in the picture. 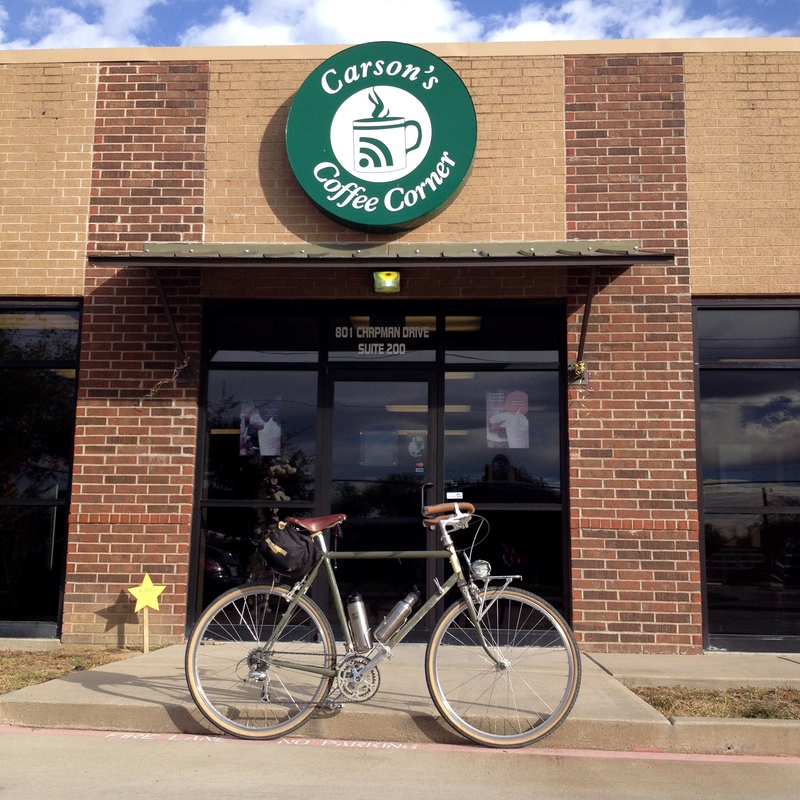 So I rode into town to give Sanger’s only “coffee shop” a second try. It was adequate. I prefer my own for the flavor and, frankly, for the fun of playing with my coffee toys. In the end, it was probably best to avoid battling the wind today. 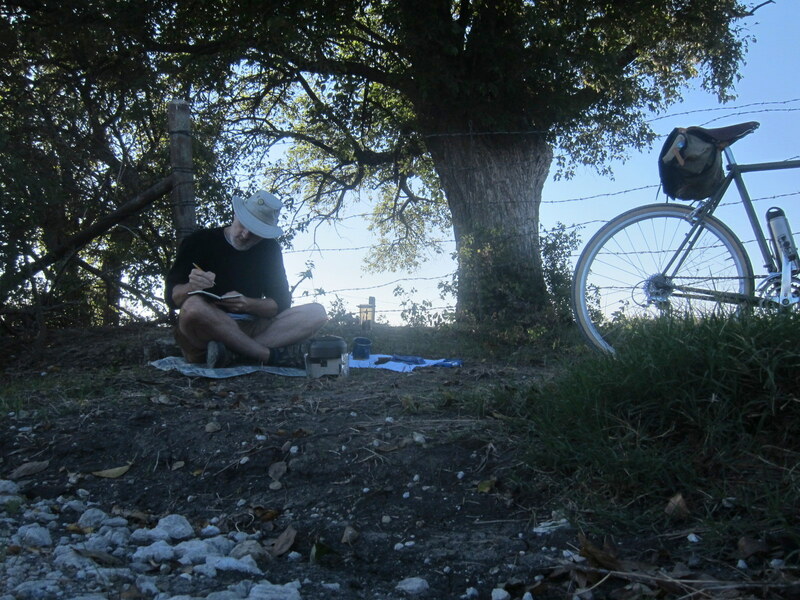 Since I had no real route in mind, I noodled around town for a while and rode back to our little place on the prairie. It was a shorter than usual Saturday ride, but that’s okay. I’m hosting a ride next weekend and I’ve got things to do. Description: It was fitting that my final cup was coincident with a ride I host every year riding on rural roads and stopping to do things like brew up a fresh cup of coffee. 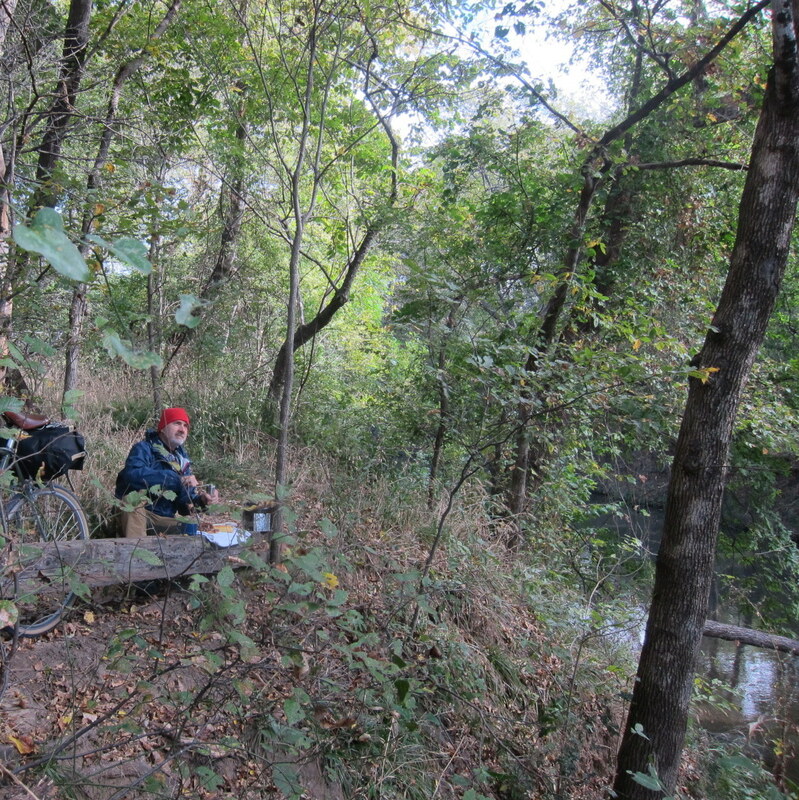 It was the Sixth Annual Fall Finale Fifty-ish Mile Country Path Ramble (The Ramble). I was joined by 23 other riders, mostly from the Dallas/Fort Worth area, but my dear friend Steve Butcher (@graveldoc), came all the way down from Stockton, MO. Steve and I enjoyed our coffee shop without walls in a wonderful park in the Greenwood community. 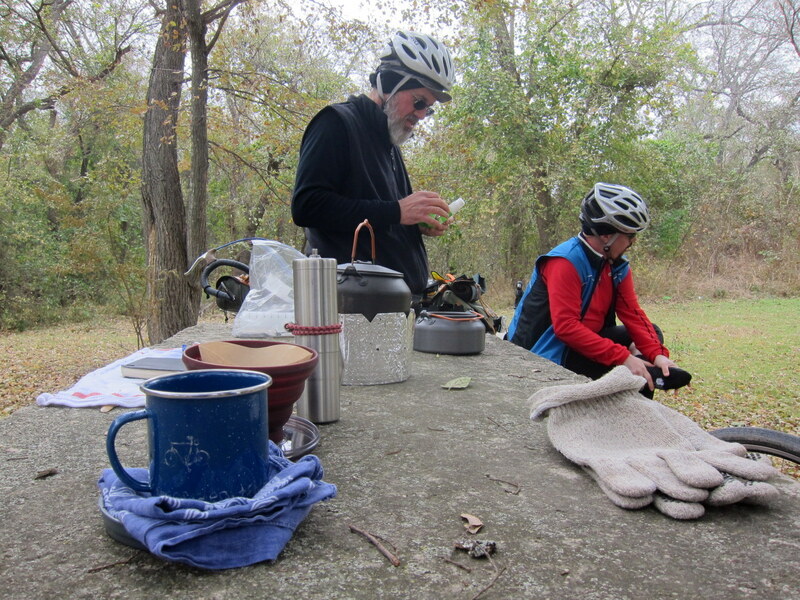 I thought we were the only ones to pause for coffee, but I later learned that a few other riders brought a thermos of hot coffee along and enjoyed some refreshment on a cold, windy day somewhere along the route. 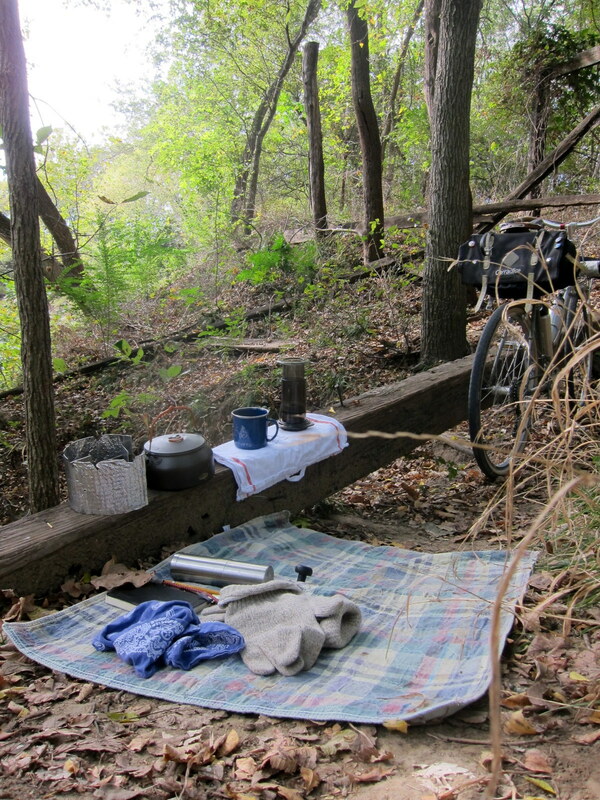 To me, it was a special way to complete this year’s Coffeeneuring Challenge. Nice report! Looks like the weather was better for the Ramble, than it was here! Surely it was. A little windier than ideal, but folks seemed to deal with it pretty well. Wish you could have made it down. When you get tired of winter, you know how to reach me. 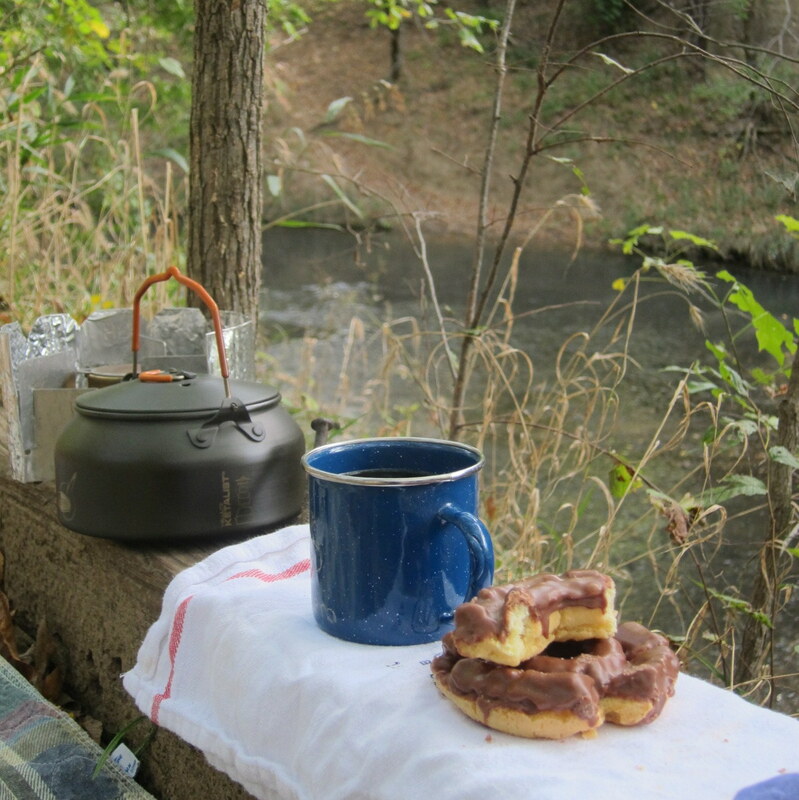 Sure, the grass is always greener – but I am jealous of your rambles and coffee outside! And I’m jealous of your C&O trail. But now that my daughter and son-in-law have moved out there, I might have an excuse to work a short tour in one day. 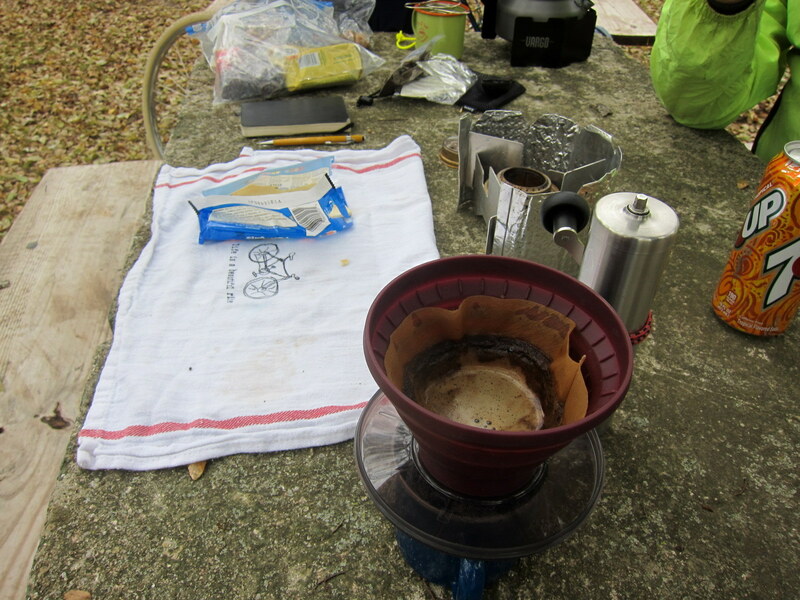 The Ramble and the coffee were both most enjoyable, as was your kind hospitality, Chris and Janet! Thanks! Ha! I’m still stunned that someone who has made the trip down here (from so far away) to do this ride…would actually do it again! That control number 3 objective of seeing how lazy you could be sounds like an idea worth pursuing. Doug, we figured that if we lay everything out right the night before, we could fire up our stove and brew up our coffee the next morning without leaving the sublime comfort of the hammock. Pathetic, I know, but I gotta try this next time. I’m glad you had a good ramble and several great cups of coffee! Did I understand correctly that a C&O ramble might be in your future? Probably not a “Ramble” in the sense of the ride I host from my house every year, but hopefully a “ramble” in the sense of a 2-4 day tour, maybe in early September. I’m pondering this. Darn. 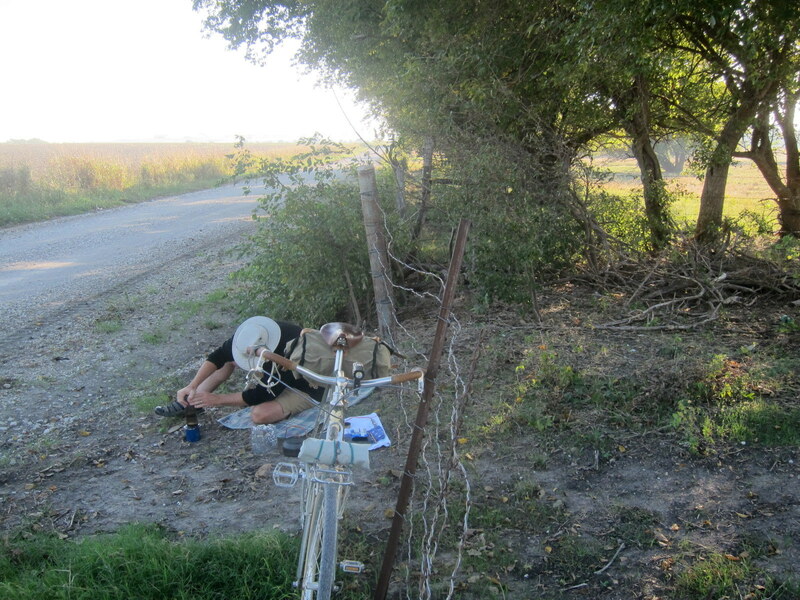 All going as planned (84.93% probable) I too will be bike touring at that time…pedaling south until I see alligators. I asked for the ACA maps for Christmas! Great plan, it would be fantastic to extend Fall by riding the climate down the latitudes! “Play with my coffee toys”. I know exactly what you mean! I completed only one “coffee shop without walls” forays this year so it’s wonderful to live vicariously through your brew up reports. Bravo for finishing the challenge. 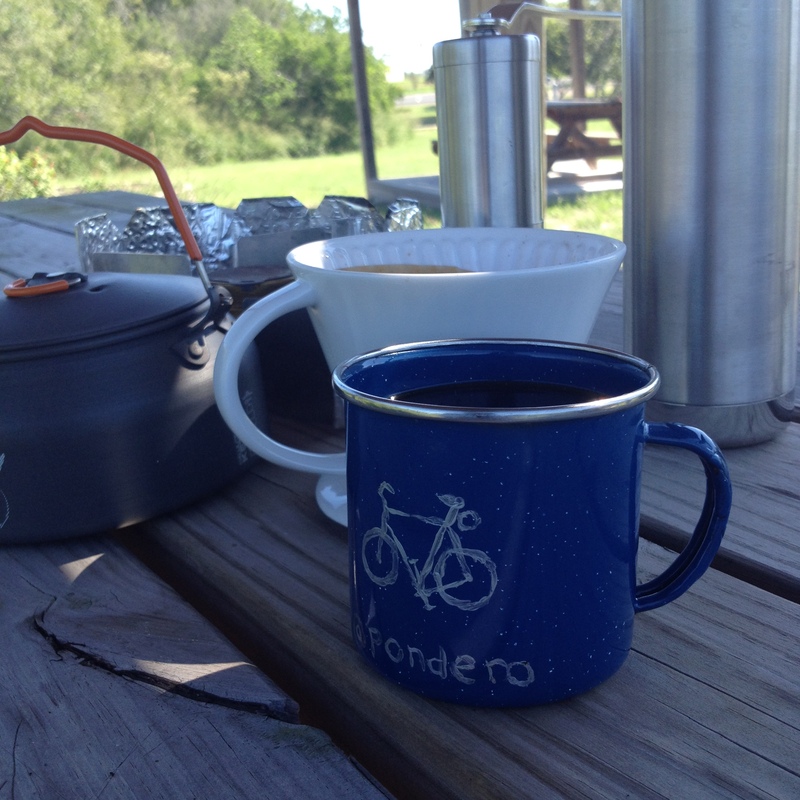 Great post, I need to start documenting my coffeeneuring as well. I got out about 4 times this fall before the subzero weather has come to roost for winter here in Wyoming. 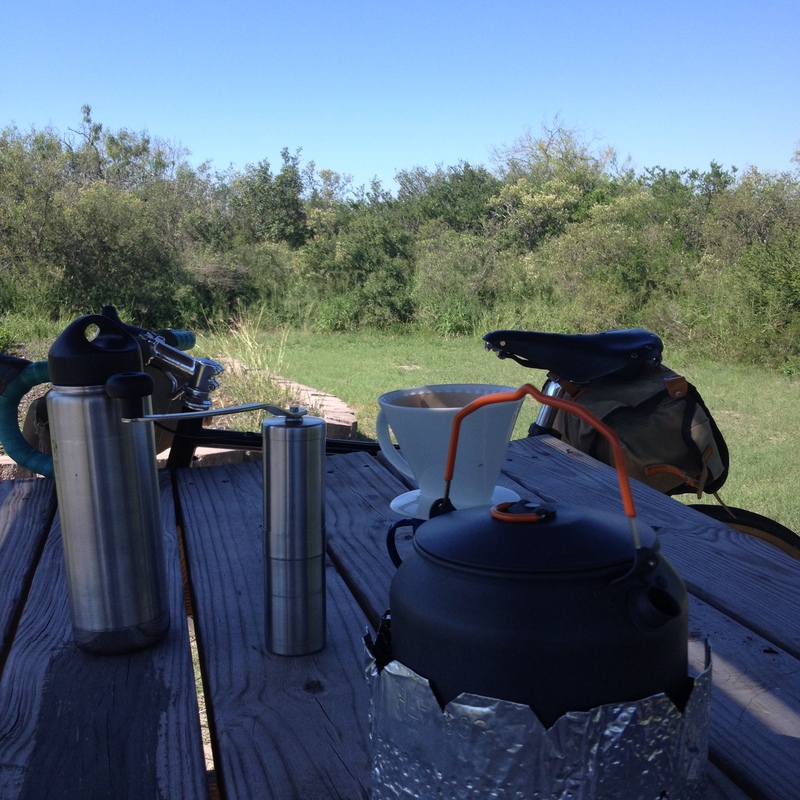 As an added twist I threw in a few cooked up breakfasts (well more like brunch) in addition to the coffee brew-up. Sometimes my bike was loaded as if I were touring! I like your style. 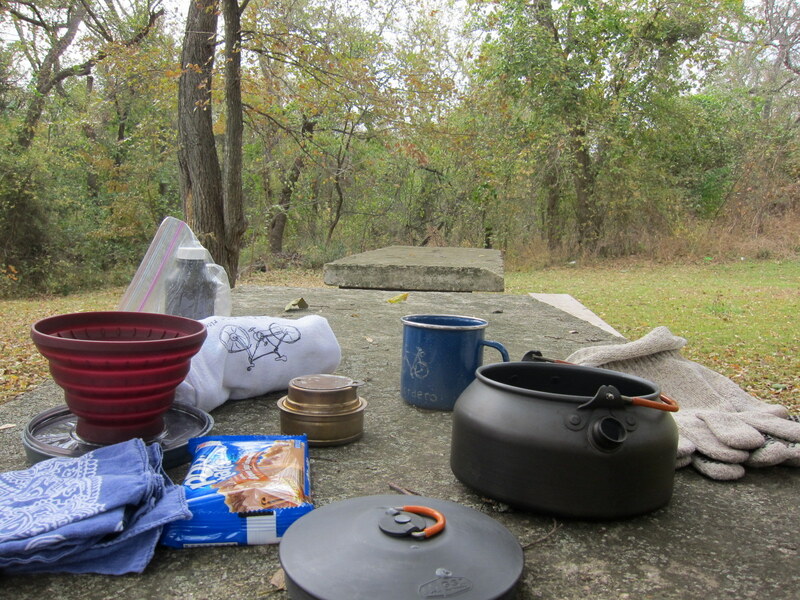 I’m a big fan of the second (outdoor) breakfast.